Since 2009, we at Research2Guidance have been exploring the developments of digital health and examining how the mHealth apps market is changing and where it is heading. We have witnessed how new digital technologies and the widespread use of wireless devices and smartphones have reshaped and disrupted the healthcare industry. The advancements of mobile technologies and behavioral changes are inevitably transforming the health insurance arena too. According to mHealth App Economics 2017 study, 53% of decision makers and experts of digital health believe that health insurance companies are the future number one distribution channel for mHealth apps, overtaking even “app stores”, “hospitals”, “physicians” and “pharmacies”. But are the health insurance companies (HICs) ready for this leading role? One would expect that HICs have taken full advantage of the digital technologies to better meet their members’ expectations. Yet, the key insights in the Health Insurance App Benchmarking 2015 report are still valid today: the vast majority of HICs have little impact in the app market with most of the companies not applying the best practice standards for their apps. So, how can HICs live up to the market’s expectations? For one, HICs should reflect on and reconsider their role in the mHealth app ecosystem. Further, a strategic analyst partner can help them define and implement their mHealth app strategy and leverage better the unique position they have to link the certain app usage and behavior change to financial benefits. Being an active partner, who offers digital personalized value to each one of their members, will set them apart. Having said that, the results from the new study draw positive attention to this prominent market player and in 2017 for the first time, “health insurers” are considered to be the most important future distribution channel. Given the health insurers’ potential key role and position in the digital health market, and to shed valuable insights on the mHealth insurance market, we talked to Yvonne Gründler, Chief Product Officer at ottonova, the first completely digital health insurance company in Germany and the first of its kind in Europe. 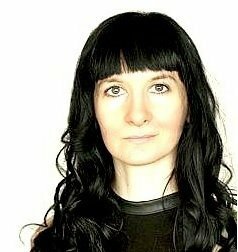 In her interview, Yvonne shares with us the trends and drivers that will shape the mHealth insurance market in the next five years, as well as how ottonova is setting new standards in Europe and takes full advantage of the digital era by offering the first digital health insurance experience integrated in company services. It is interesting to note that the name of the company is reminiscent of Otto von Bismarck, who had introduced the Health insurance Bill of 1883 in Germany. Now 134 years later, there is a new German health insurance innovator – ottonova, whose vision is to transform the whole health insurance / healthcare system and bring it strategically up to date with the digital era. Research2Guidance: As a short introduction to ottonova, could you please explain what you do and how your app/service is innovative and different from other mobile health insurance apps in the market? Yvonne Gründler: ottonova is the first digital private health insurance company in Germany. We enable our customers to take care of their health and everything regarding their health insurance digitally. This starts with the process of signing up and signing the contract – which our customers can do completely online – a first in Germany. Once the customer has signed the contract, they can download an app and through the mobile app, access all our services and fully manage their health. This includes a concierge, who takes care of all his health needs, including a digital doctor’s visit – again a first in Germany. In addition, the customer has all his documents in his app and therefore in his pocket and with him at all times. Research2Guidance: What is your business model and how do you engage with your clients? Yvonne Gründler: Our goal is to deliver personalized health to our clients and primarily focus on digital channels such as our app. Through our timeline, which in essence is a user-friendly electronic patient record, we can remind our clients about check-ups and appointments they should be completing to keep themselves healthy. In addition, we nudge them towards healthier behavior through our health prompts. If the client does not want these nudges, of course they can turn them off – but we hope that our customers come to us precisely because they want to engage and want to stay healthy, and thus want a partner who can help them do that. 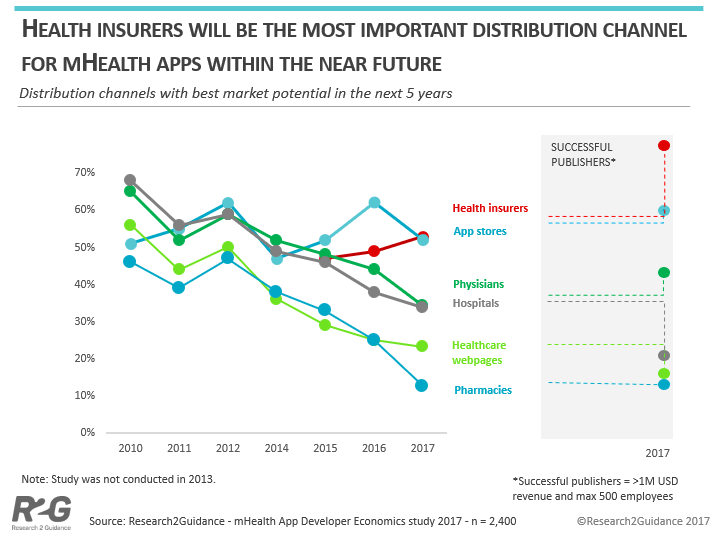 Research2Guidance: One of the key findings in the new mHealth App Economics 2017 report states that in 2017 for the first time “health insurers” are considered to be the most important future distribution channel for mobile apps. Do you agree with that and if yes, what made them even overtake “app stores” as the best channel? Yvonne Gründler: Yes – I completely agree with that. Health insurers in the past have functioned primarily as banks, taking in money and paying out when their clients hand in claims. At least that was the case in Germany. In some other countries, commissioning and the importance of commissioning well has been recognized earlier, and the relationship between the health insurer and the client/patient has changed. We are seeing this change now in Germany, and hope to be at the forefront of this change. The key is the interests of the health insurer and the client are aligned in a way that no other player can replicate. It is in the health insurer’s interest that the clients stay healthy and live as healthily as possible for as long as possible. This is also the client’s interest. So the health insurer is a natural partner and advocate for the patient. That makes health insurers the natural distribution channel of mobile apps. The health insurers have the customer/patients’ interests at heart and should be offering the right apps at the right time, as they have the information to be able to do so. Distribution through this channel enables better targeting than through conventional channels. Research2Guidance: Where do you see the main barriers for the digital health insurance market and what needs to be changed for this market to take off? Yvonne Gründler: Regulation can be a barrier – there must be structures so insurers and other players wanting to innovate in healthcare can try things out quickly (without compromising patient safety) and see what works. The attitude of the healthcare market should change as well – solutions don’t need to be all encompassing to be tried out. Centralized, whole system solutions tend to take a long time and not work if every single player needs to agree to take part before you roll something out. That is how some health IT projects have failed in a spectacular way. It’s better to start with small steps and try things out and then roll out instead of wanting to switch an entire country’s system from doing things in one way to another. Research2Guidance: Which countries are ahead of the mobile health insurance curve? Yvonne Gründler: That’s a great question – I think there are interesting models and solutions across the world – China e.g. has some very interesting solutions and businesses. The UK is doing some interesting work with the NHS and Babylon partnering up. Telemedicine is being used effectively in the US by some HMOs as far as I can tell and virtual therapy/digital doctor’s visits are more established in Switzerland, Sweden and Spain. There are plenty of things we can learn from each other. Research2Guidance: What trends do you see in the app health insurance area of the future? Yvonne Gründler: Personalization is a huge topic. Health and medicine has done very well with standardizing treatments and solutions for a long time. We are recognizing, however, that personalization can help patients and customers even more. On-demand services is another topic – people are used to getting access to services immediately in all areas of life – except for health so far. That expectation is carrying over to the health industry and we as health insurers need to meet that expectation. Research2Guidance: In what ways disruptive technologies and mobile health are transforming the health insurance business climate? Yvonne Gründler: New technologies and mobile technologies are enabling health insurers to get much closer to their customers. They are also being challenged to find new ways of cooperating with these services and new ways of reimbursement – technology moves at a much faster rate than the creation of new billing codes, and that is something we need to deal with. Research2Guidance: In your opinion, which drivers will shape the mHealth insurance market in the next five years? Yvonne Gründler: One of the main drivers is how data will be shared in the future. Who owns the data? Who stores the data? What data are we talking about – medical data, ‘lifestyle’ data? How can it be processed and evaluated? How is the data kept ‘safe’? ottonova wants to be at the forefront of this development, by accompanying people and their health over their entire life span. Thanks to being able to build a system from scratch, we are able to apply the highest standard of data protection. Another main driver is the changing expectations of the consumer – the consumer is used to having services on demand, and being able to do things digitally. Healthcare, while it is highly technologically advanced in the ‘care’ part of healthcare, has not yet been digitized in the same way other industries have. The decreasing cost of technology will also enable interesting developments. Finally, at least in Germany, the changing demographics will hugely influence healthcare and health insurances as a whole. Research2Guidance: What is next for ottonova? Where do you see the company in the near future? Yvonne Gründler: In the immediate future we are planning to launch top-up insurance products for those who cannot enter the full private health insurance. We are also going to expand our activities to keep our patients healthy, as well as investigate partnerships that will enable us to improve the German health landscape overall. Research2Guidance: Thank you, Yvonne, for your answers.